Crude oil and other petroleum products are transported in rail tanker cars on a Canadian Pacific Railway train near Olds, Alberta, on Oct. 23, 2018. 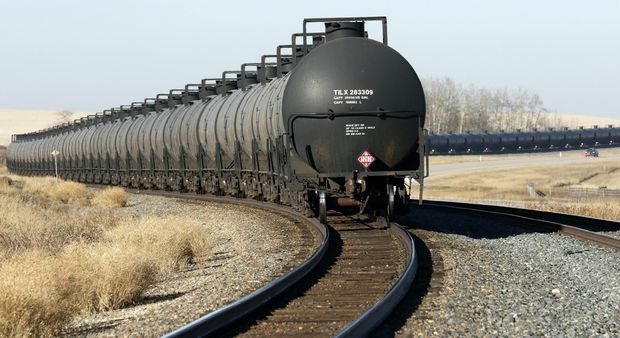 Industry groups representing miners, grain traders and forestry companies that rely on railways are warning Alberta’s plan to buy and add oil trains to Canada’s busy track network risks causing congestion and delaying their shipments. “It’s a huge problem for our members,” Derek Nighbor, president of the Forest Products Association of Canada, said Thursday. The industry lost $500-million in 2018, he said, because of poor rail service and the inability to get its commodities to market. The amount of oil moving by rail to the United States has soared this year amid rising output from new oil patch projects and persistent lack of pipeline space. But the rise in oil shipments has been outpaced by production. This has led to a glut and a steep discount on Alberta crude, which traded for US$17 a barrel on Thursday, compared with the U.S. benchmark of US$51. At a speech in Toronto on Thursday, Alberta Premier Rachel Notley said her plan to increase shipments of oil by rail would require 80 new locomotives and about 7,000 new rail cars. By adding new capacity, that should ensure other non-energy resource producers are not crowded out from the railway system, Ms. Notley said. Participants in the rail and shipping industries said Ms. Notley has not provided enough details for them to state whether they believe the western railways have the capacity to handle more oil trains. And her plan may not be in place for several months. But the push comes as rail capacity is stretched by the fall grain harvest, in addition to rising volumes of other rail freight, especially oil. Ghislain Houle, chief financial officer of Canadian National Railway Co., said on Wednesday that Canada’s largest rail carrier is moving as much oil as it did in the peak of 2014, and expects to surpass those volumes next year. He said CN has been busy reaching contracts at “very good prices” with shippers to haul oil over the next two years, beyond which volumes are expected to drop as pipelines add capacity. “We are not banking on crude, because we know the crude is a short-term business,” Mr. Houle told an investors’ conference in Palm Beach, Fla. But he said the company is reluctant to take on more crude trains in the winter when weather hampers operations, for fear of slowing down other shipments of grain and lumber. “We don’t want to choke on crude and, frankly, we don’t want to move crude at the expense of grain and at the expense of lumber in the winter,” Mr. Houle said. A spokesperson for Canadian Pacific Railway Ltd., which like CN has a monopoly on some sections of railways in the country, was not available for comment. IHS Markit analyst Kevin Birn said the industry expects to have 350,000 barrels a day of oil train capacity by the end of the year. Mr. Birn said it is difficult to assess capacity because it depends not just on the number of locomotives and cars, but also on handling facilities and labour. Mr. Birn said most trains will head south to U.S. markets rather than to the West Coast, so they might not impede other commodity traffic as much as some fear. However, mining companies remain concerned, said Pierre Gratton, president of the Mining Association of Canada.